And excuse us while we brag, but when our first Blueberry Pomegranate Vinaigrette was invented, there was no such thing on the internet. We did a Google search and we were the first to create that powerhouse combination. We’ve now added to it, and you’ll see, if you search, that we’ve added another superfruit to this combination, the Mangosteen. This recipe is super heart healthy. And stick around, we’re adding Mangosteen pericarp powder to it and will post that recipe very soon. It’s even healthier than this one with more anti-inflammatory properties and more sugar control. Because oil and water do not blend well, I store my dressing in the fridge in my Nutribullet containers so that I can just pop it on the Nutribullet to blend before serving. That’s right. I’m too lazy to stir it up or put it into a shaker. Editor’s Note: all of the ingredients are discussed at length at this site. All of them. 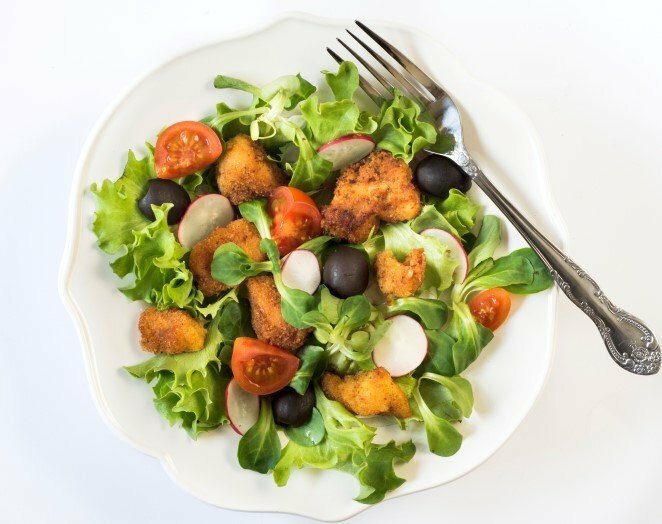 Because the fruits are anti-inflammatory, antioxidant, and hypoglycemic, this salad dressing is perfect for your heart and for your inflammation. We’d love to tell you a salad a day will keep the heart attacks away, but the FDA and FTC won’t let us. But we can tell you that parents write to us telling us that their kids are enjoying salads for the first time in their lives. And we’ve also made and tested another version of this salad dressing with one more ingredient: Mangosteen Pericarp. We’ll be posting it soon.